This September hockey fans and video game lovers will see Columbus Blue Jackets forward Rick Nash everywhere. Nash took the next step to being the face of the NHL 2K9 video game at the end of May. He flew out to Novato, Calif. (north of San Francisco) for a two-day event in which he shot photo sessions, video sessions, motion capture, interviews and more. "I have a lot more appreciation for what goes on to put these games out as a final product," Nash said. "It's unbelievable." Nash sat down with producers, developers, programmers, and others who will be involved in creating the game during his time at the 2K Sports offices. The groups asked him about hockey in general, his NHL experience and thoughts about different facets within the sport, including strategy questions. "We asked him everything we could think of that would make the game more realistic and a more accurate product overall," NHL 2K9 producer Ben Bishop said. "Being able to take his expertise is huge for us," Bishop added. "There are a lot of people on the 2K team that play hockey and follow the sport, but getting that first hand information from someone who is actually involved with it on a day-to-day basis is always helpful for us." All of it so that when hockey fans go to pick up the latest NHL 2K video game, in stores on September 9, they will be getting the best NHL 2K game created. Part of sports video games is being able to make the unthinkable play – in the case of hockey, score goals that seem unrealistic. However, sometimes truth is stranger than fiction. 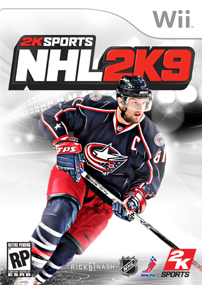 **CLICK on the cover of Nash (above right) to read more about NHL 2K9 for Wii. "The big goal he had earlier in the year against Phoenix came up a few times," Bishop said. "We just talked to him about what goes through his head when he has a couple guys to beat." According to television color analyst Danny Gare, "The best goal I've seen Rick Nash score," which came against the Phoenix Coyotes in mid-January last season could be classified as video game-type goal. But, he's had others in his career including the off the boards-between the legs goal versus St. Louis last October. "The most fun was trying different moves and trick plays on the (synthetic) ice that they can incorporate into the game," Nash said. "It's all been really cool." Others player to have donned the cover of the NHL 2K games in the past were Brendan Shanahan, Chris Drury, Jeremy Roenick, Martin St. Louis, Marty Turco, Mats Sundin, Joe Thornton and Jason Spezza was on the cover a year ago. "It's an honor," Nash said about being chosen to represent 2K Sports and the NHL. "It's a dream not only to be in the video game, but to be on the cover. Luckily enough they were high on me and I was high on them." One of the reasons 2K was high on Nash was because they decided they wanted cover athletes who are interested in video games, have played them before and are curious about how they are made (and also funny, Watch Rick's NHL 2K9 Commercial). Previously, they just picked a popular player and placed them on the cover. However, the new generation of athletes have grown up with video games their whole lives, so it is important for the video games to pick players who know and like their products. Nash has been playing hockey video games since he was kid – "from Nintendo to Sega to Playstation, Playstation 2 and 3." Nash remembers the first time he was in a video game, but says being on the cover and the positive ramifications for the Blue Jackets make this even more special. "(The 2002 game) was the first one I was in and just to see myself and play as my own person was pretty cool,” Nash said. "This is a huge deal (this year)," he added. "I definitely think it's a big deal for the Blue Jackets. We haven't had much North American recognition in the past and to get that jersey out there and that crest, and get kids aware of Columbus - I think that's the bigger deal."